In an emergency call the police on 999, for non-emergencies contact 101. For everything else, try the informtion on this page. If you’ve been involved in a road traffic collision, or think you might have witnessed an offence on the roads in London, report it using the simple online tool from the Met. Just answer the quick questions, and it will make sure you get the right advice and gather all of relevant details. Can you send photos or footage (eg CCTV, dash cam, helmet cam) of the incident taking place. Footage must include two minutes before and two minutes after the incident. If using hosted video clip, this can be shorter, but make sure a full un-editied clip is available. Time, date, vehicle registration, road, location. Details of parties involved if someone is injured, and vehicles or property damaged in the incident. 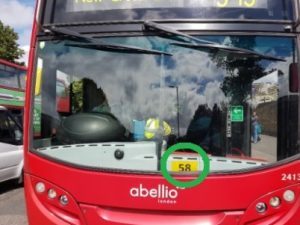 Bus Route: Busses may show an additional operational number, that may be 2 digits long or longer. They are often on a card left loose in the front window of the bus. E.g “58” below. Witnesses: Did you take their details at the time of who saw the incident. Maybe another cyclists, driver or pedestrian. • an animal is injured. If you didn’t exchange details, you must report the incident to the Police (whether or not the collision was your fault) within 24 hours. If someone is injured, you need to inform us within 30 days. · If the driver does not exchange details at the scene, details must be reported at a police station or to a police constable, within 24 hours. · Produce their certificate of insurance, if anyone at the scene has reasonable grounds to see it. If not, they must report the accident at a police station or to a constable within 24 hours. When do the Police attend? • Videos should be submitted within 48 hours of the event. • Footage should be of high quality and include at least two minutes before and two minutes after any incident. • For prosecution purposes, video evidence can only act as corroboration. This means that you will need to attend a police station and give a written statement and must be prepared to attend court to give evidence in person. • Original videos kept safe, and should not be edited in any way. • Videos must not rely on a perception of distance such as a close pass as the apparent distance will vary according to the type camera and settings. There are other issues with video evidence, such as parallax error, which makes objects appear close together when they are seen in line. In general, evidence of provocation or disproportionate reaction will mean that no action is taken. • You need to have 2 minutes of video before and after an incident so that the Police can be sure that no prior incident has caused provocation to the incident. • Your initial video sent to the police does not need this full 2 minutes before and after, but you do need to have retained it somewhere so that it can be used in legal proceedings. Many truck/van firms are striving for ever greater safety. They will often act on evidence of poor behaviour of their drivers (thought reporting to The Police and FORS in addition is worthwhile. 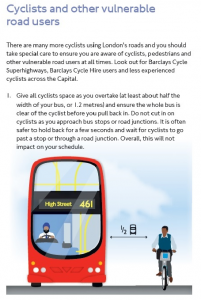 Reports about London Buses All TfL’s bus drivers are expected to follow TfL official guidelines for all bus drivers. 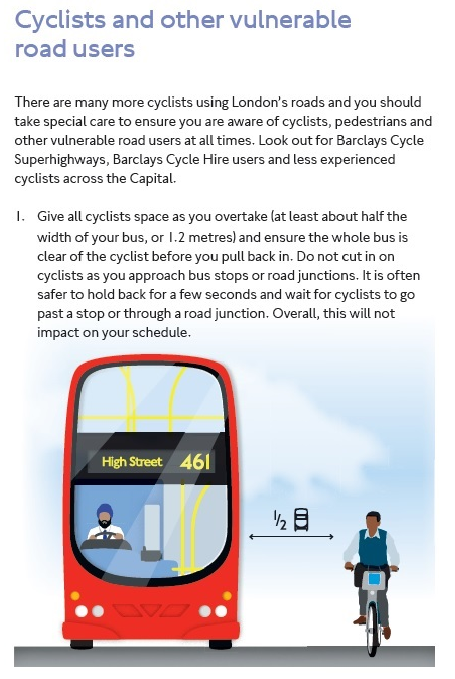 The guidelines for bus drivers includes the illustration opposite (click to download a larger version). TfL say: We take feedback about our staff very seriously, so please provide as much detail as possible so we can investigate your issue. Due to data protection, we can’t always give detailed feedback on the actions we take. There are several ways to report dangerous behaviour on the road. Please add to this list by contacting southwark ‘at’ lcc.org.uk or the London Cycling Campaign’s website.